“The water runs into the hull and then the ocean becomes cooler. The ark is ventilated by the sea water and returns to normal.” The announcer’s voice was sterile as if the boredom of the room he recorded in came out in the vocal cords. She sat there staring off into the catacomb of ventilated materials, the surf that was no surf, the voice consistently anesthetizing her thoughts, the clarity of it producing an unnaturalness, a calm no human being was supposed to have. His words rendered all the wonder of the ark into concise familiarity. The ark was a mystery, a huge vessel with the ability to produce seas, and the sea under them was no exception, but now, in this voice’s hands, she just wanted to get off and explore, when the headphones went silent a little Muzak hit her ears and she almost pulled the things off. To her right large spirals of the ark’s native plastics cut into the air, mysterious and yet their exact tuning was what churned the waters below, the voice cheerily noted this, but with out the awe she always saw in the cluster of ideas, the means of water the ark contained. 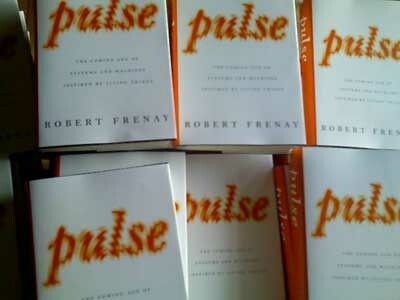 Apparently Pulse is available for free online now, hence Frenay seems to be turning his book into a meditation which is probably the right way to do it. Books these days are less fixed informational oddities than they are brand identities to be consistently added to (just look at Freakonomics). Pulse is for Frenay (a former jazz critic and music promoter amongst other things) a category for his evolving thoughts on complexity, emergence, and more surprisingly politics and the ethics of the everyday. Frenay refers to his subjects as “new biologists” and proceeds to characterize them as environmental zealots, waste is inefficiency in the world of Pulse. Nothing here will surprise those already familiar with small worlds, emergence, feedback, non-linear equations, and Herman Daly’s ecological economics. The book begins, like most tech books, with numerous descriptions of biological processes at work, Frenay is particularly obsessed with fish’s use of the swirling channels of water their fins leave behind as a means of further extending their propulsion. What makes the book unique, is that Frenay begins to extend his thinking into the politics of the everyday. Frenay wants more than just simple governmental policies to cover environmentalism and subsidies for the sciences, he wants a complete over throw of the previous generations reliance on simple causal methods of evaluation. He is, so to speak, working out a line of thinking that like the deconstructionists, wants to do away with platonic thought, but perhaps differs from contextual reasoning and Asian philosophy, by finding regularities or absolutes in the a-logical and non-linear. When Frenay applies this to farming for instance, he finds the organic farming methods and their reliance on hacking naturally occuring systems more satisfying than the current GM products of the green revolution. Frenay makes a rather good, and very impassioned, plea for the pros of organic farming, by simply making the case that nature is an intelligent and complex beast that is evolving. Every GM plant results in gene transfusion, weeds around round-up ready corn, develop immunity to round-up, a fungus equipped with a gene for ethanol successfully managed to kill an entire field of plants by transferring it’s ethanol gene to the plant’s fungus encrusted roots. Frenay’s point is that simple logical hacking is one sided, it doesn’t take into account the actions that result from it’s introduction, hence Frenay advocates a logic of assimilating complexity. As much as Doctors fear over prescribing anti-biotics so viruses don’t evolve resistance to them to fast, so farmers should be wary of introducing GM species as the resulting ecosystem will adapt to overtake them. I can’t remember the name for this, but essentially Mosanto is stuck on categorical logic, our GM plant is unconnected from the resulting system it’s introduced in, Frenay however believes in interdependent systems, to create good is to make bad, to introduce a gene is to create a system that will result in other opposing or complementary genes. For another argument similar to this check out Dave Pollard’s pieceon how the eradication of small pox has allowed for unsustainable population growth. What Frenay is suggesting is that actions can’t be taken only using the perspective of one object, you can’t modify a gene only thinking of the benefits it will have for the plant you’re modifying, you have to consider the results this action will have on the resulting system you’re introducing it too. Better regulation is needed, but Frenay thinks that an understanding of the environment, how natural cycles replenish the land, could lead to self-sustaining farming. Pulse makes GM and organic sound like races being run to feed the world, that’s hardly an exageration, but Frenay’s other points about the destruction of soil ecosystems, and using phermones for insect repellent are also intriguing. Frenay’s other political arguments are interesting but flawed compared to his organic arguments. He mentions Kenyan activist Njoki Njoroge who complains of the IMF’s over prescription of the same crops in anti-poverty programs that caused a commodities drop meaning farmers who were part of the IMF’s program ended up worse off than they were before, this is true and Ms. Njoroge’s complaint against the IMF is valid, but Frenay seems to be stretching to connect ideas like emergence and biological metaphors to the problems of world trade and the incompetence of many NGOs when it comes to poverty relief. Some nonlinear systems are exactly solvable or integrable, while others are known to be chaotic, and thus have no simple or closed form solution. A possible example is that of freak waves. Whilst some nonlinear systems and equations of general interest have been extensively studied, the general theory is poorly understood. Hence, one of the problems behind going from physics to economics is that the equations describing nonlinear behaviors don’t lead to the casual simple links that Daly wants to claim between the two. While it’s common sensical to assume a link between say the use of energy in a factory and increasing entropy in general, building an actual model that could describe how that all breaks down and then designing a system to take advantage of the feedback and other nonlinear phenomena occurring would be essentially impossible. But of course, that’s going to far. What bothers me more about Daly and Frenay using entropy in their arguments, is that ultimately energy doesn’t care what form it’s in, wether is pollution, nuclear blasts, clubbing seals, energy has little preference for it’s use or ultimate destination. For instance while rubber shred from tires might require energy to be re-used in the economy, from the stand point of entropy it still contains the energy put into it minus the energy lost to make it during manufacturing, if Seth Llyod’s concept of entropy as information holds, then the rubber still contains energy in the organized form of it’s structure and informational make up, untill this dissipates it has yet to become useless except in the economic sense. Economists, like physicists, struggle to explain the macro and micro in their worlds, ecological economics demands that the macro be considered in every micro calculation, a feat well beyond the limits of most city halls, urban planners, and other ecologically minded folks. Daly has written a text book outlying how to work out common economics tools such as cost benefit equations using ecological economics, but the actual practice of ecological economics has little to do with the farflung world of entropy. I think sticking with uneconomical growth (the compiling of waste and other useless and valueless by products of manufacturing) and long terms costs is a better way of preaching the virtues of ecological economics. I also think that all businesses should have to list their by-products on closed loop exchanges (here is the Iowa Waste exchange) too. Finally, more stringment environmental laws (such as ones that make companies responsible for top soil erosion, water quality, etc.) would ensure that the cost of an item’s environmental impact would be reflected in price. Oh yeah, and while we’re at it water use and emissions markets would also be nice. Ecological economics needs to focus on the energy required to sustian the ecological economy. Physics aside, it’s the depletion of natural resources that matters, long after we exhaust every energy source or die in a fuzz ball of pollution the universe will still be working by entropic principles. Frenay ends out with another political plea against corruption in the US Government. Again, I agree, but Frenay’s arguements seem bent at times and often lack exacting solutions, but merely prescribe a cultural change of mind-set. Perhaps the problem with Pulse is that Frenay moves to fast between subjects. While the links between new biology and technology are obvious as much as organic farming syncs with it well, he would have to go deep into the philosophical and cultural underpinning between the machine age and biological age to really bring about and show how today political’s spectrum is linked to these changes in ideas. After all, nature is probably as corrupt as any American house member and probably just as clever in harvesting new resources for their own gain. Yes, the Eocene peroid had a higher concentration of CO2 in the atmosphere, but it also marked one of the largest peroids of extinction in history and also might have been caused by a meteor hitting the earth. Hence, if we’re already over 1/2 way to a climate that possibly killed off billions of life forms that’s hardly re-assuring. I was under the impression that fluctuations in the Atlantic salt pump caused this.